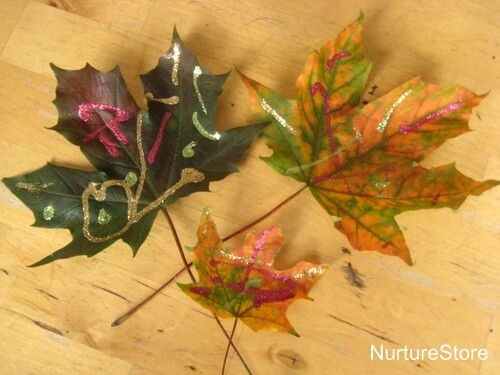 Here’s a beautiful idea for some autumn leaf art, adding a little extra sparkle to the season. 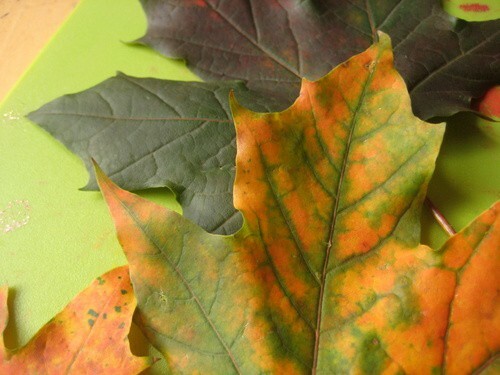 Are you like us and returning from every outdoor trip with handfuls of autumn leaves? We can’t resist collecting them, they’re so beautiful. 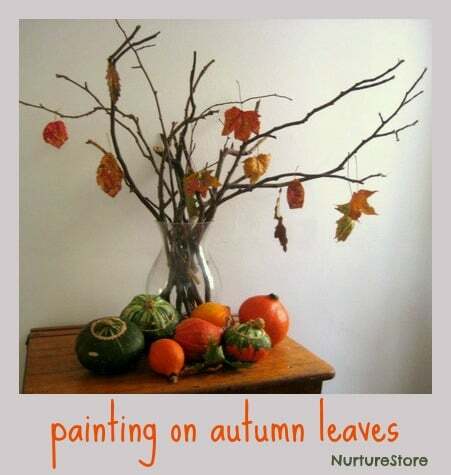 Here’s an idea using some of the gathered leaves to make a beautiful autumn art tree. 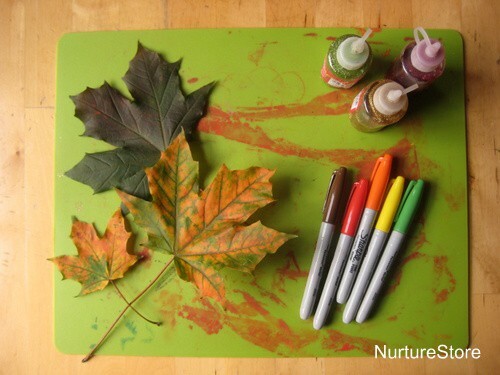 At home after our walk, I set out some of the leaves, along with some permanent markers and some squeezy bottles of glitter glue. An irresistible invitation to draw. 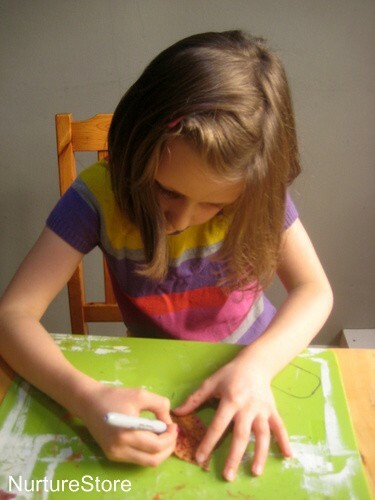 We often use these plastic place mats as a quick protective layer under our creating, especially when there are permanent markers and glitter involved. They’re quick to grab and easier for the children to get by themselves than a whole table cloth. I find they give just the right amount of coverage for a small project, and then we can craft at one end of our kitchen table, and still have space at the other end for eating! 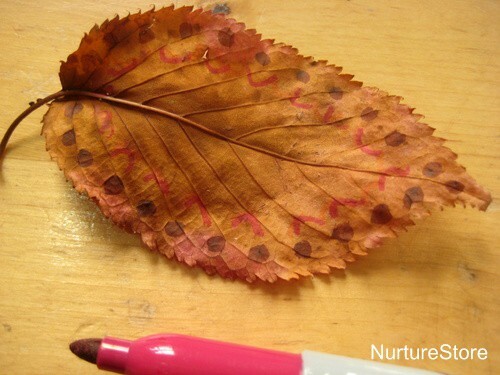 Permanent markers are great for drawing on leaves, allowing you to add lots of detail. Once the glue was dry, we added some thread to each leaf, and hung them on the branches of our seasonal tree. 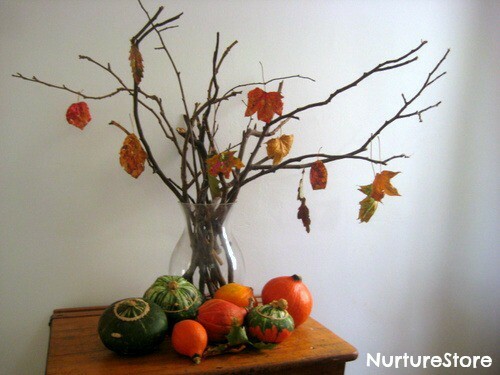 These branches sit in our entrance hall all year round, and we change the decorations to match the seasons. You can see our variations for Easter, Valentines, Summer, New Year Wish Tree, and Word Birds. Hi Natalie. What’s happened is that the leaves have dried, rather the wilted. So, while they have curled just a little, they’ve actually preserved themselves – and look lovely!